In 1909, Edward Payson Weston walked from New York to San Francisco, covering around 40 miles a day and greeted by wildly cheering audiences in every city. The New York Times called it the "first bona-fide walk . . . across the American continent," and eagerly chronicled a journey in which Weston was beset by fatigue, mosquitos, vicious headwinds, and brutal heat. He was 70 years old. 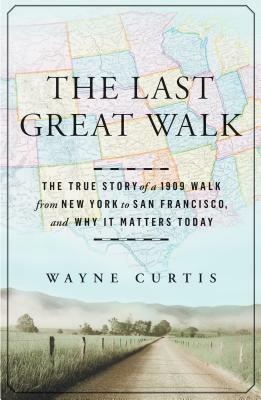 In The Last Great Walk, journalist Wayne Curtis uses the framework of Weston's fascinating and surprising story, and investigates exactly what we lost when we turned away from foot travel, and what we could potentially regain with America's new embrace of pedestrianism. From how our brains and legs evolved to accommodate our ancient traveling needs to the way that American cities have been designed to cater to cars and discourage pedestrians, Curtis guides readers through an engaging, intelligent exploration of how something as simple as the way we get from one place to another continues to shape our health, our environment, and even our national identity. Not walking, he argues, may be one of the most radical things humans have ever done. Wayne Curtis is a contributing editor at The Atlantic magazine. He's also written for The New York Times, The Wall Street Journal, American Scholar, and This American Life. The author of And a Bottle of Rum, Curtis was named Lowell Thomas Travel Journalist of the Year in 2002. He lives in New Orleans.